Keep members entertained and informed. We provide solutions for crystal clear television programming throughout your health and fitness club,. Turn your establishment into the ultimate destination for sports or entertainment with DIRECTV’s exclusive packages and customized music. Keep customers entertained and show impressive presentations with audio visual systems from Creative Media Solutions. 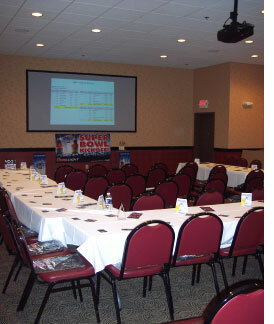 Do you want to make your Event Center, Resort or Hotel a meeting destination spot? We design systems for all meeting rooms that allow you and your customers to give impressive presentations with the latest technology so they'll use your facility again and again. Have a spa in your hotel or resort? Let us show you how to provide customized music solutions to enhance your customer’s experience. Assist your guests and free up your staff for more important duties with informative and interactive maps, floorplans and directional signage. Call us or visit our Digital Signage page to learn more. **Ask Us About DIRECTV Specials!